Can you believe this cover came from a photograph? 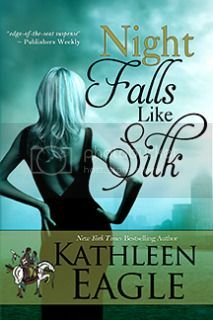 Our cover art magician at Bell Bridge Books is our own Deb Dixon. I dreamed of a stout team dashing through the snow pulling an old-fashioned bobsled, the kind featured in two of the three stories in THE SHARING SPOON, and Deb made this dream come true by somehow watercoloring a simple photograph. Don’t try to tell me a computer had something to do with this. It’s Deb’s fairy dust, I tell you. I look at this cover, and I hear jingle bells. 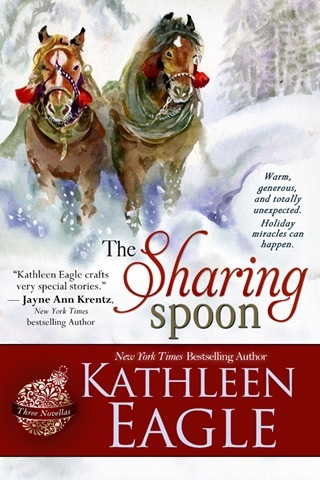 Hot off the press in trade paperback and e-book, THE SHARING SPOON contains a Thanksgiving story, a historical Christmas tale, and a contemporary Christmas story inspired by my own early teaching career. 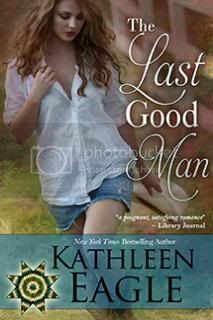 And the cover has already been nominated for an award. 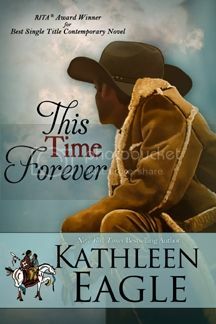 Please stop in at The Cover Cafe and cast your vote for “Favorite 2013 Holiday Romance Cover.” Let everyone know what a beauty this baby is. Born to privilege, Cynthia Boyer wants to share her gifts with children in need. Kyle Bear Soldier understands that his bank account is not a measure of his fortune. Two good people from two different worlds meet at an inner city elementary school, where hope plants its seeds. What are the chances of discovering a glass half full and hearts overflowing when everyone partakes of The Sharing Spoon? 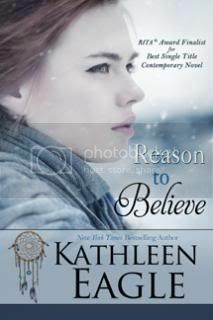 As Christmas 1879 approaches in Dakota Territory, mixed-blood gunslinger Wolf Morsette reluctantly agrees to help Boston-bred mail-order bride Emily Lambert find refuge among his Metis people for the two newly orphaned stepdaughters she’s just met. In spite of the season—or maybe in light of it—four strangers set out on a journey across the frigid prairie in search of home and family. 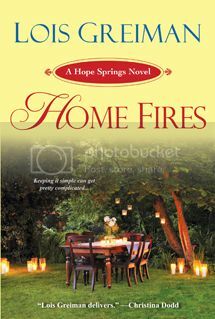 Sergeant Luke Tracker is finally coming home for the holidays, and his sister Frances can’t wait to introduce him to fellow teacher Hope Spencer. But the Army is Luke’s life now. A few days’ leave with his family and a generous dose of traditional celebration is all he has in mind, and playing Santa Claus at school is nothing more than a fun little favor. Until Hope lands on his knee. There’s a scene in “The Twelfth Moon” that I lifted straight from my husband’s childhood memory bank. (I’ve made more than a few withdrawals from that bank. From a writer’s perspective it’s richer than Wells Fargo.) Church was an all-day affair, and a good part of it was spent getting back and forth. His family regularly used a team and wagon for transportation, and in the winter they took off the wheels and attached runners. Yep, back in the old days. 20th century South Dakota. Which brings me back to November being an eventful month. For the third time in my life I spent my birthday in a hospital. The first time was, according to Mama, the second battle of Fredericksburg. Okay, I have a big head. Twenty-three years later I spent my birthday and most of the rest of the month losing a kidney. This year it was my cowboy’s turn. First hospital stay of his life, and he picked my birthday. And pretty much the rest of the month. But all he lost was a gall bladder, and who needs that, right? He’s doing very well without it, and with all that hospital time, you can bet I made a few more withdrawals from my Indian cowboy’s memory bank. Oh, yes, time does add romance to the past. You’ll see! 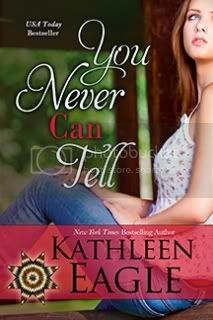 Kathleen Eagle is the award-winning, New York Times best-selling author of over forty novels. 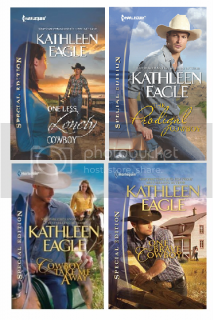 This entry was posted in Christmas, Cover Cafe, holiday romance, novella, Western Romance. Bookmark the permalink. 2 Responses to Is November Over Yet? Love the cover, too. Sure does feel like Christams. 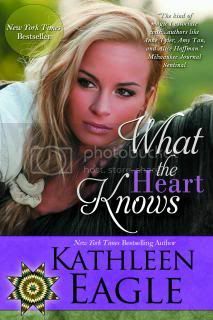 I ABSOLUTELY ADORE YOUR COVER! It is soooo perfect–such a feeling a Christmas. 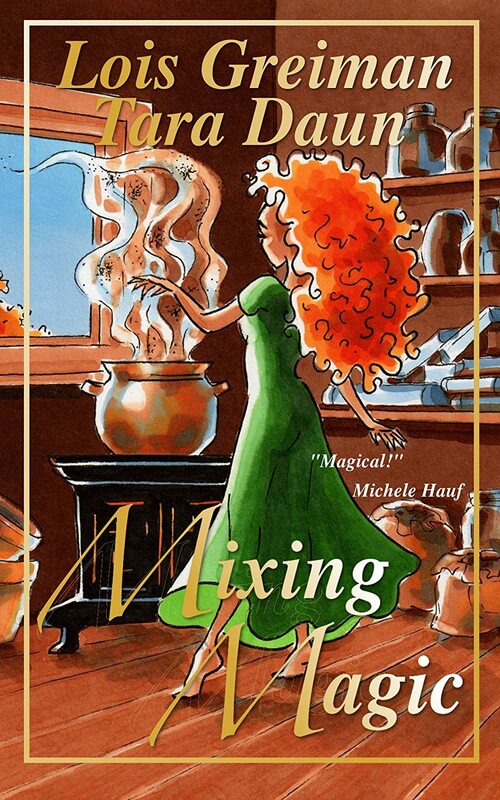 You are right–it’s like magic! I never would have guessed it was anything but a painting.